Aamir’s next film Ghajini which was recently in news for getting sold for an astronomical 90 crores plus will see Aamir Khan in a bald look. The versatile actor who will play the role of a victim of short term memory loss all set to avenge the death of his wife, will be seen in a bald look this time round. Ghajini is a physcological thriller and has Aamir Khan, Asin ( South actress) and Jiah Khan in the lead. The movie is inspired from the Hollywood thriller, Memento. To get close to Memento is an arduous tasks for even a great actor like Aamir. Let’s see whether the talented actor manages to surpass our expectations, yet again. 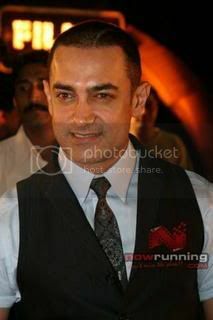 Share Exclusive Pics : Aamir Khan’s Bald Look In Ghajini with your friends on Facebook. looking stunning as ever……..the movie will be a huge hit………. Looks good and interesting hair cut, really though whats with that line in his scalp. Looks like he just got out of a brain surgery some month ago. On dis 25th Dec………..Rokzzzzzzzzz Aamir…..Best of luck…………..
Amir khan is best in Bollywood without a shadow of doubt, Ghajini proves who is the Bollywood Big Dady Actor. Amir has prove himslef he not soft posh but rock hard Actor can act any role . Sharuk was my Fav before but Now Ghajni(Amir) is my top leading Rated Actor. Go on Amir Khan Show the Boollyywwoodd, WHO”s THE DADDY.